A HIGH-END CONDOMINIUM community that has for six years basked in the benefits of its premier waterfront location is enjoying a renaissance that portends a meteoric rise to the top levels of the Charleston-area real estate market. Renaissance on Charleston Harbor has offered spectacular views since its two eight-story buildings rose into the South Carolina sky on the Mount Pleasant side of the Cooper River in 2002. Its residents can watch the sun set over Charleston Harbor as vessels large and small glide effortlessly between the busy port and the endless Atlantic Ocean. Their anoramic views include the timeless skyline of Charleston, the new Arthur Ravenel Jr. Bridge, historic Fort Sumter and the USS Yorktown. The location of Renaissance, within shouting distance of Patriots Point, is equally difficult to beat. Charleston is just a short drive away, as are the beaches at Sullivan-s Island and the Isle of Palms. 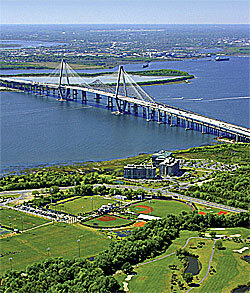 You can also get to the Holy City by walking or biking across the nearby Ravenel Bridge. The area around Renaissance is expected to be developed sometime soon, offering an array of restaurants and shops within easy walking distance. Despite the views and location, however, property values at Renaissance on Charleston Harbor didn-t rise appreciably until owners of many of the 100 units took matters into their own hands, upgrading their homes and investment properties with top-of-the-line amenities such as high-quality hardwood floors and bathroom fixtures that reach beyond the realm of the ordinary. By putting their own personal signature on their homes, they also added greatly to their value, according to Kathy Sweet, an agent with Carolina One Real Estate. Her interest in the condominium building is more than professional; she also lives there. "It-s really a nice place now, and people who have upgraded are getting a good return on their investment," she says. Sweet points out that she recently sold a Renaissance unit for $3 million, well over twice its original price. 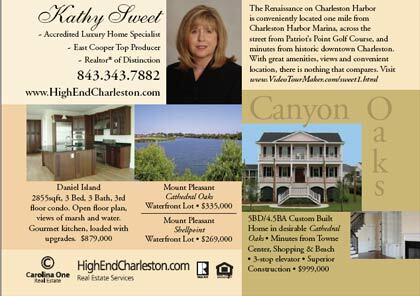 She adds, however, that at around $328 per foot, Renaissance homes are still selling for less than other waterfront condos in the Charleston area. Asking prices at Renaissance on Charleston Harbor, which offers six different floor plans from 2,044 square feet to 4,166 square feet, range from under $1 million to $4.289 million. According to Sweet, bargains are still available, especially among units that have not yet been upgraded. "You can still put your personal touches on these units," Sweet says. "This is a wonderful place to live. I feel blessed every day to be able to get up and look at downtown Charleston and the harbor. And there-s only so much waterfront property."